Discussion in 'Server & Client Support' started by Chris, Feb 4, 2014. This post will explore a variety of solutions for common UO client crashes. This is a list of best practices for issues free gameplay. Turn this option off, it was designed for older computers and does not work well when using multiple clients. Find the razor icon on your desktop, right click on it and select properties. Check the box marked "Run This program in compatibility mode". Select Windows XP Service Pack 3 from the list. In the Privilege Level section check the box for Run this program as an administrator. Optional: Disable Visual Themes & Desktop Composition for improved performance. Disable this feature as it is outdated and provides no purpose other than alerting you to the fact, that you are installing or running a program. Open your computers control panel and look for the User Accounts Section. 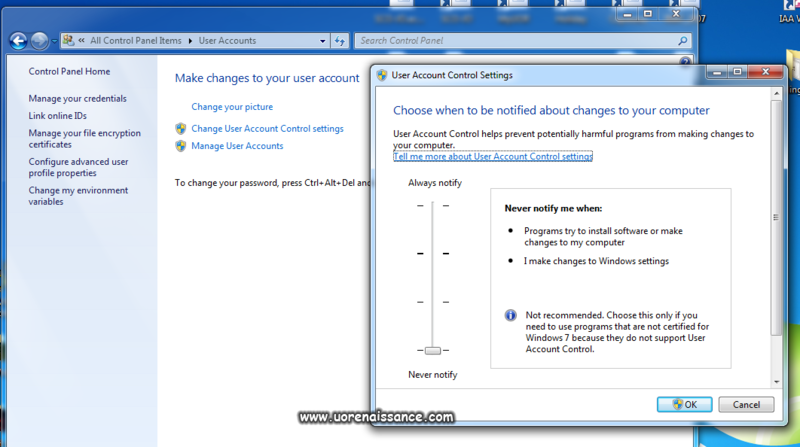 Click on "Charge User Account Control Settings"
Depending on the type of antivirus software you have the method will vary. Searching your anti virus software makers website for "Exclude Program" or "Exclude Folder" will get you to the right instructions. Check the options section of your AV software for where to make this change. C:\Program Files\Razor or C:\Program Files (x86)\Razor depending on your install. C:\Program Files\Razor\Razor.exe or C:\Program Files (x86)\Razor\razor.exe depending on your install. Example of Trend Micro Exclude Folder Screen. "Razor was unable to locate and load a suitable UO Cliloc file. Some text may not be displayed." 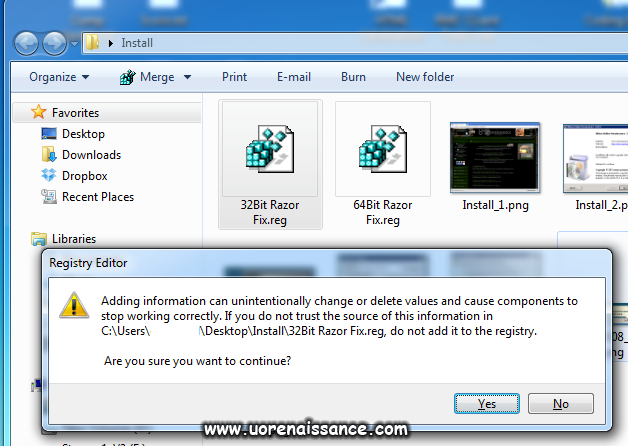 Cause: This error is caused by razor attempting to read a registry key that is missing on your system. Solution: You need to download or create a registry fix for your computer by following the instructions below. If you installed the UO:R client into the default "C:\Ultima Online" folder you can download the applicable file for your operating system. If you installed the client in a custom location make sure to edit the registry files to match that location. Pay attention to the file format when editing. Double click the file you downloaded and apply the changes to your registry. To find out what operating system you have find your my computer icon, right click it and select properties. You should see a window similar to this. Cause: This can happen when trying to run Ultima with and without razor. This error is caused by the data execution prevention service. 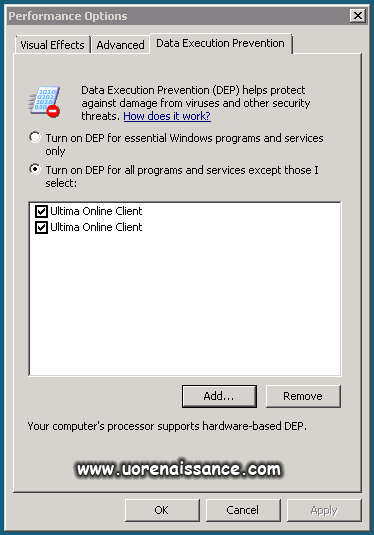 Solution: You need to exclude Ultima Online from the DEP service. Step 1. Open up your computers advanced system settings. Click on the advanced tab and then click on the performance settings button. Step 2. Select the Data Execution Prevention tab and click Add.. Step 3. 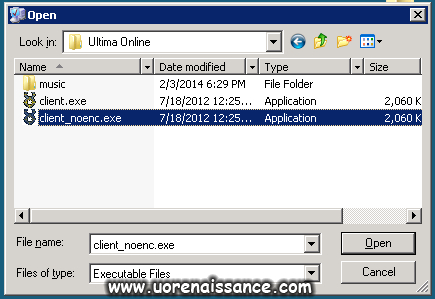 Browse to the C:\Ultima Online Folder and select the Client.exe and the Client_noenc.exe files. Once both are added close the performance settings and attempt to load Ultima. You should now be able to load Ultima Online with and without razor. "Error Cliloc.enu not found when loading razor, Random Crashes "
Cause: This is caused by the way that various newer operating systems handle installations in the Program Files and Program Files (x86) folders. Solution: You need to relocate your Ultima Online installation into a non protected folder. 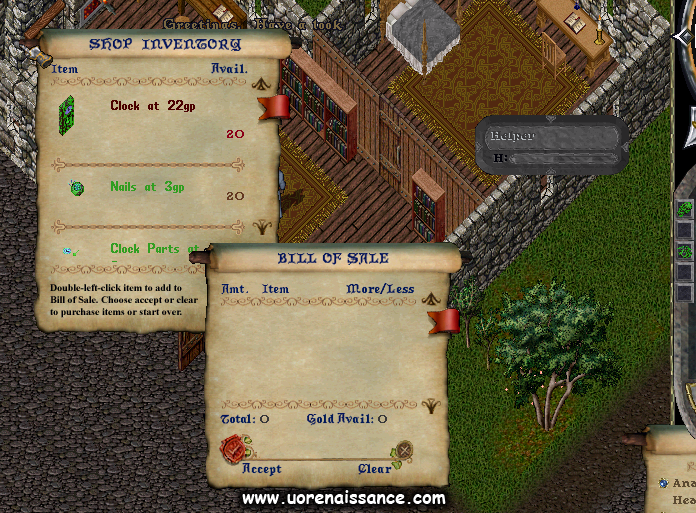 Download and install the complete UO:Renaissance client package found here. This should resolve the problem by installing Ultima Online into the correct folder. Step 2. Right click on the folder and select cut. Step 3. Navigate to your C:\Program Files\ folder. Step 4. Paste the Ultima Online folder into the C:\Program Files\ folder. Step 5. Open razor and update the client to match this picture. Cause: This can be caused by a damaged installation or more likely an incorrect setting in the UO options. 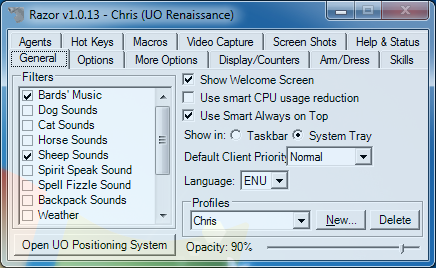 While ingame hit the Alt Key and O to open the UO options screen. Find the checkbox for "Switch to 565 Color Mode"
Make sure this option is set to false. 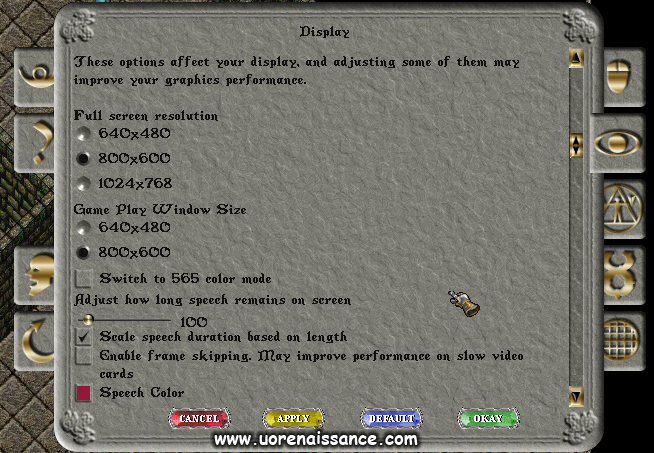 Cause: This is caused by razor saving a bad screen position for your UO window. Very common on multiple monitor systems, or systems that have the resolution adjusted. Related Systems: Windows Vista, 7, 8. Possibly more. Press the Alt Key + Enter Key at the same time twice. Press the Alt Key + SpaceBar at the same. This will bring up the properties window for the Ultima Client, even hidden. This can take a bit of work, but if you hover over your task bar, you can get the ultima window to show up. Clicking on it normally will not help. 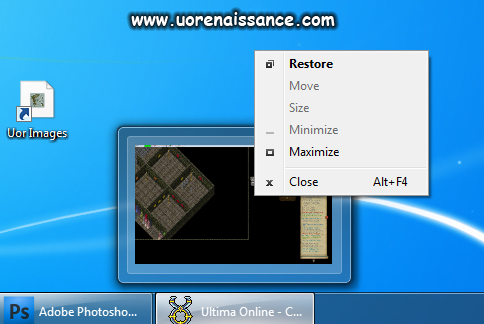 Right click on the UO window as shown in the picture below and select "Maximize"
If this is not an option, try Minimize and then Maximize, or Restore. This should restore the window to your main screen. Make sure to log out of UO properly and make sure razor is closed. This should update the screen position and resolve the problem. You can also use a special utility to force a minimized or offscreen window to your main screen. 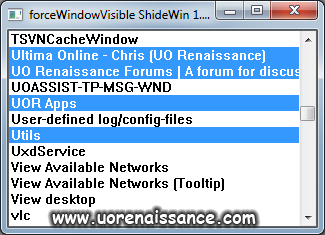 Download the "ForceWindowVisible" application shown here. 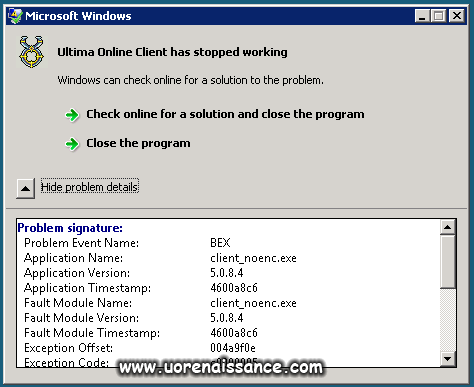 Run this utility and look for your ultima online client as shown in the picture below. Using a combination of clicking on it, and solution 1 shown above you should be able to restore the lost window. Find your way to your profile folder. Typing %appdata% into the search box is the best method. Find and open the razor folder. Find and open the profiles folder. Find an open the profile you are having problems with. Make 100% sure Ultima and Razor is closed for this step. Right click and choose open with Notepadd++ or Notepad. Find the 2 values WindowX, and WindowY and edit them slightly. However they should be positive numbers between 0 and 500 for each. Tinker with the values until you can open razor and log in without the UO window disappearing. Cause: This can be caused by a corrupt profile, or damaged skillgrp.mul file located in your Ultima Online Installation. Make sure to log out of ultima before attempting this fix. Navigate to the folder that you installed Ultima Online into. Most likely C:\Ultima Online. Find the folder showing the affected account name. Select a character whos skill list is showing correctly. Copy the skillgrp.mul found in this folder. 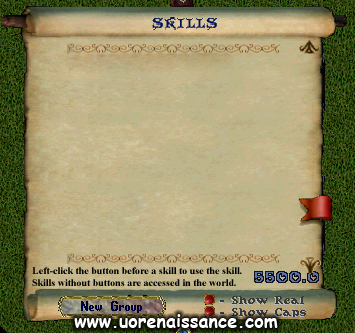 Open the characters folder that has a blank skillgrp.mul. Paste the copied file, overwrite the existing one. This should resolve the problem. If it does not, you might go ahead and delete this characters whole folder. Cause: This is a common problem on 64 bit systems and can be caused by several factors but most likely the installation location. 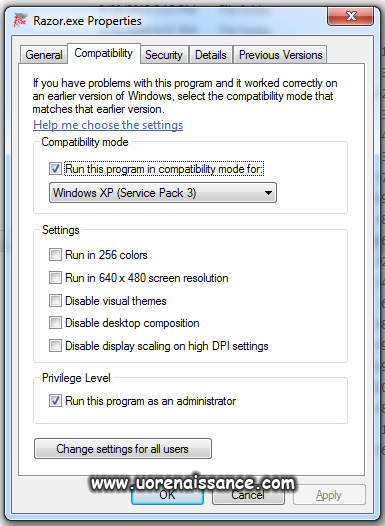 Make sure compatibility mode is set to windows XP Sp3, and Run as administrator is checked. While ingame toggle the force resolution option in razor while hitting the apply button in the options screen. If this does not help try one of the following. Update your razor shortcut to reflect the new location. If that doesn't help try re-installing razor from the website. Starmap, Zavgard and Vlar like this. Your syntax looks correct, however it sounds like your theme in windows is possibly making it hard to see. Have you tried adjusting your color scheme via the themes window so you can see the text? It's possible that you might not be able to color the bandage timer since its a processed value. oh thanks for response, i see what your saying the windows bar where the stuff is displayed is a off blue color . im try to change color of that bar . UO Window title bar has Chinese text. Cause: This is caused by teamviewer adding a icon onto the title bar or a missing English identification in uo.cfg. Quick connect can also be found at. Options → Advanced → Show advanced options → QuickConnect button → Configure and uncheck Show QuickConnect button. If there is no UserLanguageCodeString then add UserLanguageCodeString=ENU on a new line. Everytime I login I have to re-do all my in game hotkeys. They show, but they just don't work. Most are on my numpad. For example the macro will say num 7 - ebolt. When i press it, the number 7 shows up in game but no spell. Num Lock is on. When i delete the macros and try to remake them now they just say regular 7 as opposed to num 7. All the while numlock is on. Both client and razor are running as admin. I have no razor profiles. Any fixes for this? Again, you shouldnt have to re-make your hotkeys EVERY time you login. I just bought a computer with Windows 10. The first few times I played there was no problem. I had my work IT guy try to set Windows 10 to be able to log in to my work desktop and use two screens but he was unable to make that work. He said I would need Windows Enterprise at work for the dual screens to work remote. I bring this up because the only thing that happened to this brand new computer between UO working and now it not working was that. Now.. Razor starts fine, but when the UO client comes up, the screen will blank quickly then the UO window will be greyish and unresponsive, then it disappears, then comes back on but without the windows window around it - like where you see Min Max X - is not there. Then when I load UO all the way, the game goes to fullscreen mode. I do not have the game set to run in full screen mode. I do run it as administrator and do run both razor and uo client on compatibility mode Windows XP, I forget which service pack. Any thoughts or suggestions is appreciated! FYI - My Windows 10 computer came with an Nvidia GeForce GTX 745. I went to Nvidia's website, downloaded and installed the latest drivers, everything's good now. 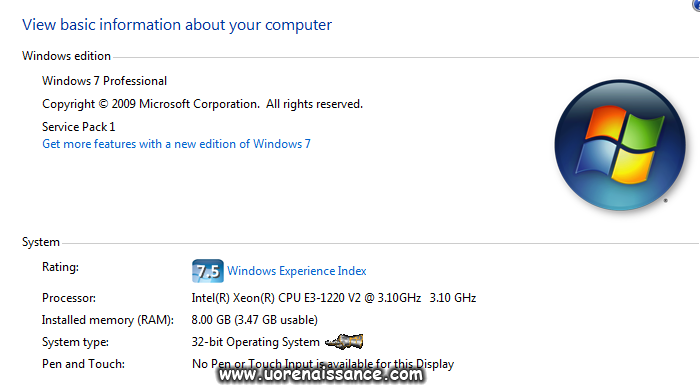 Razor / UO Client runs like a champ now - using Windows XP Service Pack ?? compatibility mode of course. Having some issues with Razor that started this past week. When opening Razor it freezes on "Retrieving most recent profile" on the splash screen. When this happens it shows 100% HDD usage in my task manager and freezes my computer. If I leave it long enough it will eventually load UO and work fine (10-20+ minutes), but this doesn't always work. I've tried all of the suggested fixes in this thread, as well as a clean reinstall of Razor (haven't reinstalled UO). I've checked my HDD for errors, malware, and viruses. All drivers are up to date (and weren't updated within the past month). Do you run uo and razor in compatibility mode and as administrator? Could also be a conflict between a setting in razor and your system.. Did you change any system settings in razor or uo lately?